Paneer is a firm Indian cheese which is one of my all time favourite things to use in a curry. It holds its shape when cooked and takes on flavours perfectly. Paneer is also a good way of introducing even the most avid meat fan to vegetarian curries. I have used an old faithful curry paste blend that works well every time. I started the curry off the day before so the paneer had plenty of time to marinade however a couple of hours ahead would be fine if you don’t have the time. This curry is gently spiced so you can taste each element however if you want to ramp up the heat then go ahead by adding more chilli powder, or fresh chilli if you prefer. 1. Get going on the curry paste by simply combining all of the listed ingredients with a splash of water to bring it together to form a relatively thick paste. Cut the block of paneer into chunks which are around an inch in size. Take half of the paste and add into a bowl with the paneer and ensure it is well coated. Cover the bowl with cling film and place in the fridge until you are ready to cook. 2. When ready to cook, the split peas need preparing before you get going with the rest of the curry. Place them in a large pan and add 400ml of water straight from the tap. Bring the pan to a boil, add the split peas, lower to a simmer and cook for half an hour until the split peas are tender. Keep checking the split peas as some may need slightly longer depending on the variety and size you use. 3. Meanwhile take a large wide bottomed pan (preferably non- stick!) and heat half of the vegetable oil over a medium to high heat. Take the marinated paneer and fry until it gets a little colour; turn the pieces regularly so the spice marinade does not catch. When they are golden, remove from the pan and set aside. If there are any pieces of marinade that have burnt onto the pan then give it a quick rinse as you will need to use this again. 4. Heat the remaining oil over a low to medium heat and cook the red onion gently. I always take plenty of time over making the base of my curry so the flavours develop. Cook the onion until translucent but ensure it does not colour too much as this can make onion taste bitter. When the onion is a minute or so away from ready, toss in the black onion seeds and finish off together. Spoon in the remaining curry paste that you reserved and cook gently for a few minutes. 5. Take the chopped tomatoes and add into the pan making sure they combine well with the onion mixture. Simmer until the tomatoes are reducing and thickening. The time this takes depends on the size of the tomatoes and how juicy they are but be patient as slowly cooking the tomatoes base will make all the difference. 6. When the split peas are cooked and tender, add these to the pan along with the paneer. Cover the pan and simmer again until hot and until the curry is the consistency you like. Along the way you may find that you want to add a splash of stock if the split peas get a little dry but, again, this depends on how juicy the tomatoes are. For the final few minutes of cooking, stir through the shredded spinach and finish off with some freshly chopped coriander. Serve the curry with your choice or rice or bread such as chapatis and enjoy. Paneer, split pea and spinach curry- ‘the best curry you’ve ever made’ was the quote from my fellow diner so it must be a winning combination! 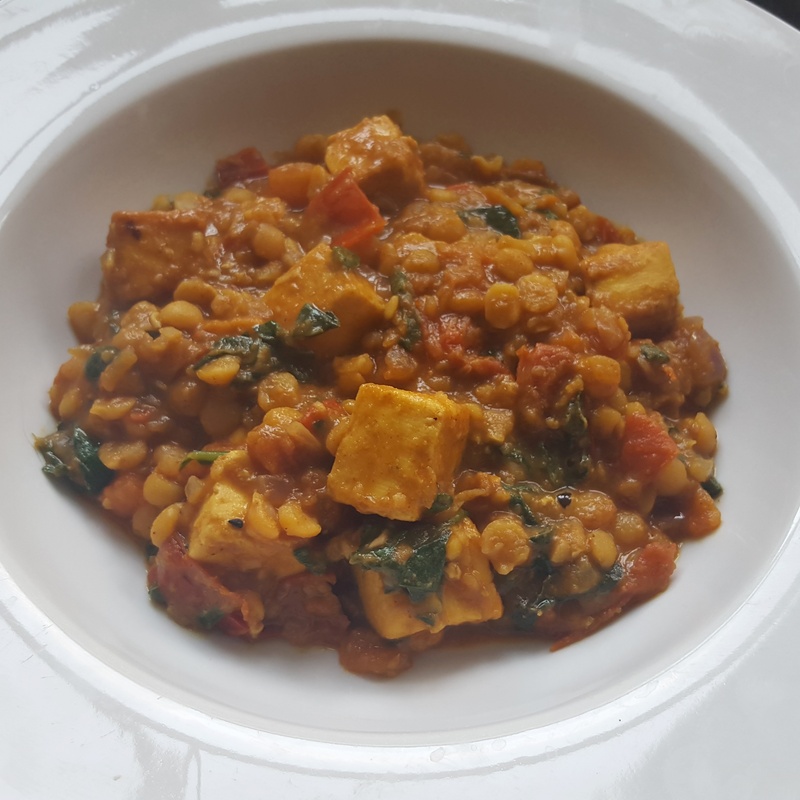 This entry was posted in Recipes and tagged amchur, chilli, coriander, cumin, curry, lentil, paneer, spice, spinach, split pea, tomato by sotiris14. Bookmark the permalink.